Jerome, Jerome K. 1889. Three Men In A Boat. If laughter really is the best medicine, then have I got the prescription for you! 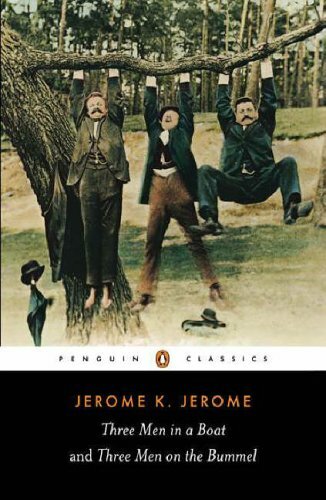 Read some Jerome K. Jerome. Start with Three Men In A Boat. You might think since it was published so long ago that it would be dry and stuffy. You don't really--or at least I usually don't--think of classics as being laugh-out-loud funny. But give Three Men a try. Get to know J (our narrator) and his friends George and Harris. And let's not forget the dog, Montmorency. These friends are going on a trip--and you're invited. They're going boating on the Thames. "THERE were four of us - George, and William Samuel Harris, and myself, and Montmorency. We were sitting in my room, smoking, and talking about how bad we were - bad from a medical point of view I mean, of course." I also enjoyed the story about Harris singing comic songs. And the bit about the tin can of pineapples was great. Have you read this one? Do you have a favorite scene or story? I haven't yet, but after this except I will for sure! Every time I see a review on this one it gets placed higher and higher on the TBR. I'm glad you liked it! I SO loved this book! It was read long enough ago that I can't readily come up with a favorite scene, but it did have me laughing, which surprised me since I didn't expect an "old" book to be so darned funny! I read Connie Willis' book "To Say Nothing of the Dog" before I knew about this one -- in fact, it was because of Willis that I found it. Glad I did and glad you enjoyed it too. Awesome review! not my usual read, but your writing makes me want to go get it right now! If only a book store were open at midnight. . . oh well. I would like to see your thoughts on some of the books I read and also on my writing. Check out my website here: The Novel Housewife. Let me know what you think about my writing. It's not perfect yet but I think I am getting somewhere. As many know about me, I'm a book snacker; I keep oodles and oodles of books around like bags of Cheetos and open them up and pop a bite or two in my mouth here and there. Three Men in a Boat has been under my bed for years. Yes, I've been reading little pieces of it now and then for YEARS! I've heard about this book for years and never got around to it. If you say it's enjoyable I know it has to be. I'm checking my library for it right away. And I wanted to let you know I'm posting my review of A Mercy and the answers to your questions from the Weekly Geeks Review catchup post at midnight Friday. I wrote about this book recently, for Weekly Geeks, the one where we discuss the books from our hometown. Really must read it. I loved, loved, loved this book. It's been awhile since I read it, so I can't specifically remember many funny plot points, but do remember laughing a lot. If you haven't already read it, there is a book that kind of parallels this book. It is called To Say Nothing of the Dog, by Connie Willis, and a lot of it deals with this particular book. It, too, was great, so you might want to check it out. No wonder I like your blog! It's amazing how many favourite books we have in common. Three Men in a Boat is one of my top reads. I've read my penguin copy so many times, the spine is cracked and the pages are yellow. I still laugh aloud at so many parts, and think of him reading the medical dictionary each time I have an ache or pain I wonder about. One of my ambitions has always been to go to the UK and follow their canal journey. Three Men on the Bummel wasn't as great I don't think.